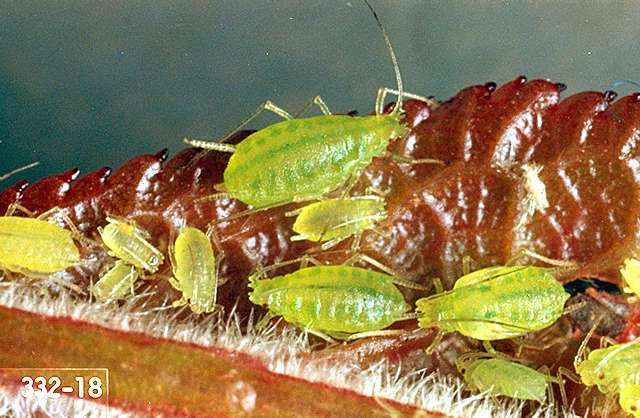 Description, biology and damage Hop aphids are soft-bodied and yellowish to bluish-green, oval insects. Their feeding causes leaves to roll. Typically, the aphids are found on the underside of plum leaves, or inside the rolled leaves. Heavily infested plants may drop leaves, resulting in severe defoliation. 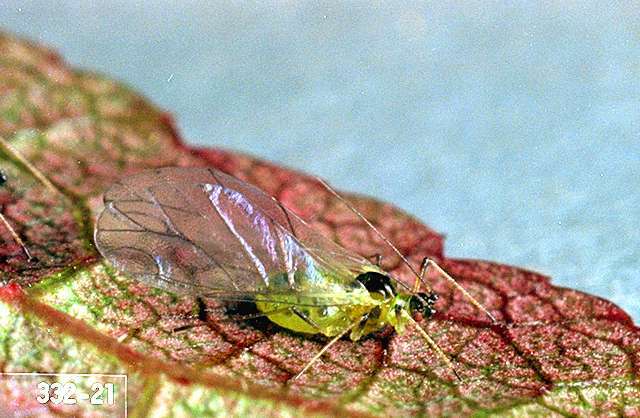 The leaf curl plum aphid is typically pale green to yellow in color during the summer and darker green to brown later in the year. Feeding by the leaf curl plum aphid causes severe curling of leaves on plum. Biology and life history The aphid overwinters as eggs in crevices and twigs on plum, prune, or cherry. The eggs hatch near budbreak and the nymphs feed on unopened buds and the underside of the leaves. The leaves curl and protect the aphid as they feed. After two to three generations, winged forms are produced that migrate to summer hosts, which include weeds, ornamental plants, and vegetables. Following several more generations, the winged forms migrate back in the fall to the fruit trees to mate and lay the overwintering eggs. Some aphids remain on the winter host all year round.